This unusual photo postcard comes from the late 50's or early 60's.The back reads: " Very modern 100' x 50' pool, across from the restaurant, is a splendid place to cool off on those hot summer days." Further description is that it is an Ektachrome Transparency by Paul L and Sally L Gordon , Rochester NY. This was the period when the modern phase of park development was just being considered. 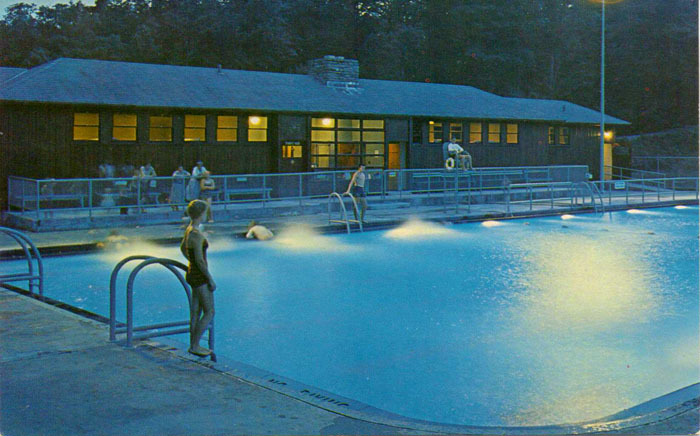 The popular Lower Falls pool was once open even at night because of the demand. It was the only pool in the park and served both cabin area and the camping population that at that time was located at St Helena. At present the facility is closed, a reflection of the six decades that have passed since the Lower Falls swimming pool was built.